Free handicap means unrestricted placement of the handicap stones. It is used less commonly than fixed handicap, where players place their handicap stones at the standard fixed hoshi (star-points). It is sometimes called "Chinese handicap" or "French handicap" (even though few French players play this way). AGA rules, Ing rules and New Zealand rules allow free placement of handicap stones. On KGS the implementation of Chinese rules as well as New Zealand rules allow for free handicap placement wheras fixed handicap is used for AGA rules. 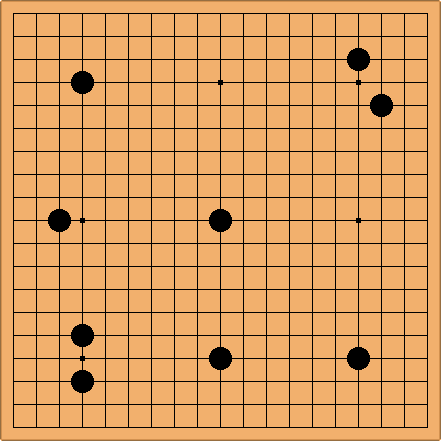 The usual placement of the handicap stones, on the hoshi points, drives the Black player to the concept of thickness and influence. This concept is less instinctive than the concept of territory. 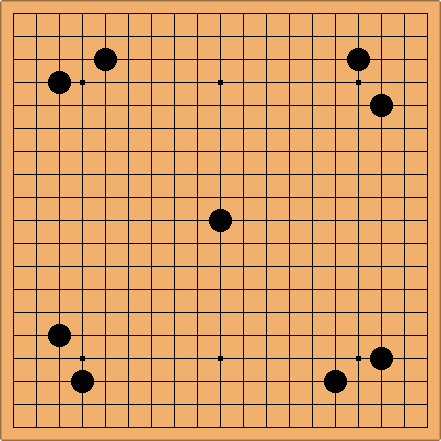 Free placement allows Black to stick with territorial thinking, but he can also make an even more influence-oriented placement, like a diamond in the center, or two Great Walls. Actually, as far as I know, the 'French handicap' is because the FFG uses (at least partially) Ing rules. However, the average French player doesn't know about it and still places his stones on the hoshi points. Correction : the French Federation rules are the same as AGA rules, not Ing rules. Though it uses Japanese rules, DGS also allows free handicap placement--in fact, EVERY game with a handicap is a free-handicap game. However, it seems that many players find it courteous to place their handicap stones on starpoints. Unless (nowadays at least) you flag the option "Standard placement". --Hman? Hicham: I often play with chinese rules on KGS and they allow free Handicap. With nine stones I would choose this. very territorial, but you just have to keep your center stone alive. and play calm. Alex: Here's something I might suggest to kyus if they were offered 9 stones with free placement. 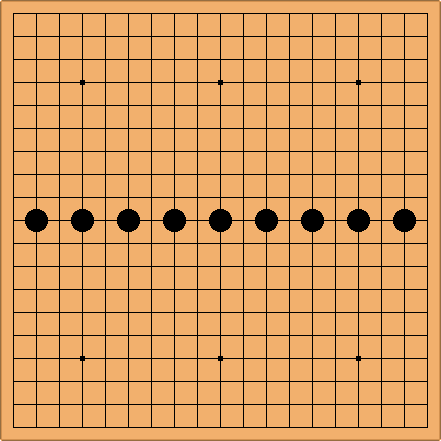 I think it would be too tempting for White to play wedges on both empty sides as in the diagram, but that just makes it easy for Black to reinforce further. 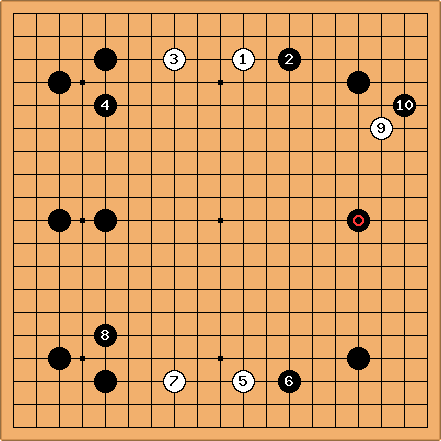 In both diagrams, Black is prepared to sacrifice the marked stone if necessary. Bob McGuigan: I don't know whether it has been discussed elsewhere on SL but Pashley's question made me realize that probably different placements of handicap stones have different overall value in some abstract sense of perfect value. Perhaps with perfect play in a 9-stone game (standard placement) black would win by 120 points. With a different placement maybe black could win by more. Of course one's temperament would make different placements more or less effective, too. Andrew Grant: It's worth pointing out that if you are going to use the handicap system to define differences in grade, you should stick with the traditional pattern. Free handicaps give Black a larger advantage than the difference in grade warrants. It should also be remembered that a handicap is not there to give Black an easy game, but to give White an equally hard game. Some of the patterns suggested above make it almost impossible for White if she's only 9 grades stronger than Black. Bill: I had some experience giving large free handicaps in the '70s. To my surprise, I did not find that free placement gave Black a perceptible advantage, even when the original placement looked as if it did. Andrew Grant: Well, that may be true, but there's another advantage of the traditional handicap placement; it forces Black to learn how to play for influence. I suspect that, left to their own devices, weak players would place their handicap stones on the third line, go for territory, and never dare to try anything as counter-intuitive (to a beginner) as playing for central influence. Pashley Yes, but I suspect that a weak player doing that would be likely to have White hand him a rather painful and very clear lesson on central influence. Tomas: Do the rulesets that allow free handicap placement, specify when the clock should be started? 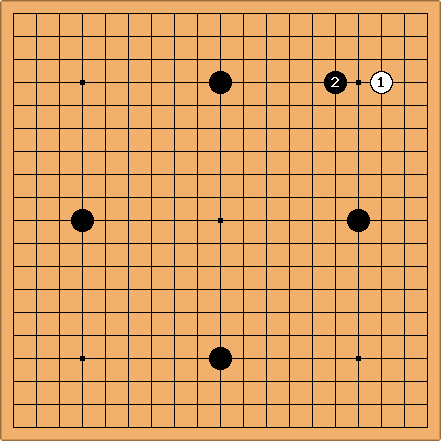 It feels more consistent to start black's clock before the handicap-stones are placed but i can't find any official rules for this. Can anybody say how this usually done? Andrew Grant: The use of the clock in tournaments is not properly the business of the rules. 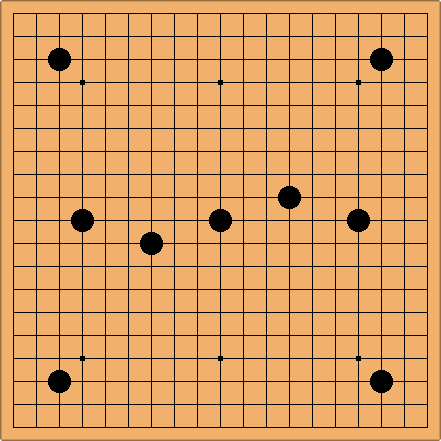 Such things (like time limits and byoyomi settings) come more under the heading of conditions of play and are decided by the tournament organiser. Having said that, since free handicap requires Black to use some judgement in placing his stones, I would say the initial placement of the handicap is no different from any other move and therefore should be done with the clock running. anonymous: we play free handicap (we call this Chinese handicap btw) a lot. With free handicap the clock starts immediately. With n-stone handicap, it is like white pass her first n-1 moves. 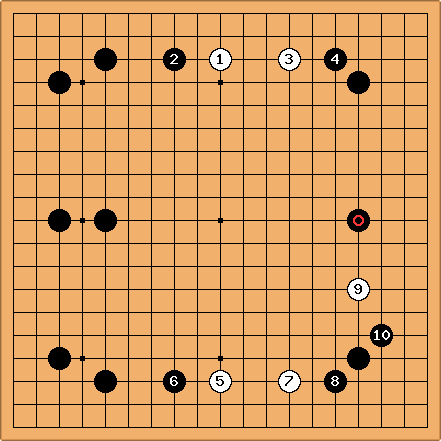 Yesterday someone started a 4-stone handicap game against me with the following sequence, which appeared very difficult to me. We both got two corners and the black stones worked very well together. DrStraw: In the past, instead of playing a 3-game kadoban with fixed handicap stones I have played 2-game kadobans with handicap changing by "half a stone". What I meant by half a stone is that the progression when from 4 stones fixed, to 3 stones free placement, to 3 stones fixed. It was not exactly half a stone between the types, but it worked very effectively for my opponent to learn how to play with other than hoshi stones as he was improving.